HONORABLE MENTIONS: Eighteen More Excellent & Undervalued Episodes of XENA: WARRIOR PRINCESS (Post 9 of 9) | THAT'S ENTERTAINMENT! 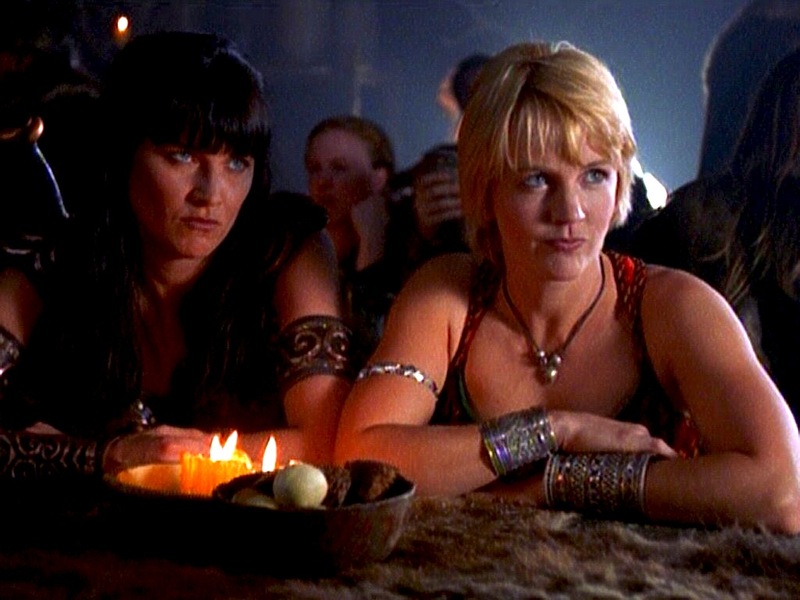 Welcome to another Xena Thursday! Today, we’re finishing our series on 18 “Honorable Mentions” that were not included in my list of the 60 best episodes. But first, if you’re unfamiliar with the series, Xena: Warrior Princess was a spin-off of Hercules: The Legendary Journeys and aired in first-run syndication from 1995 to 2001. 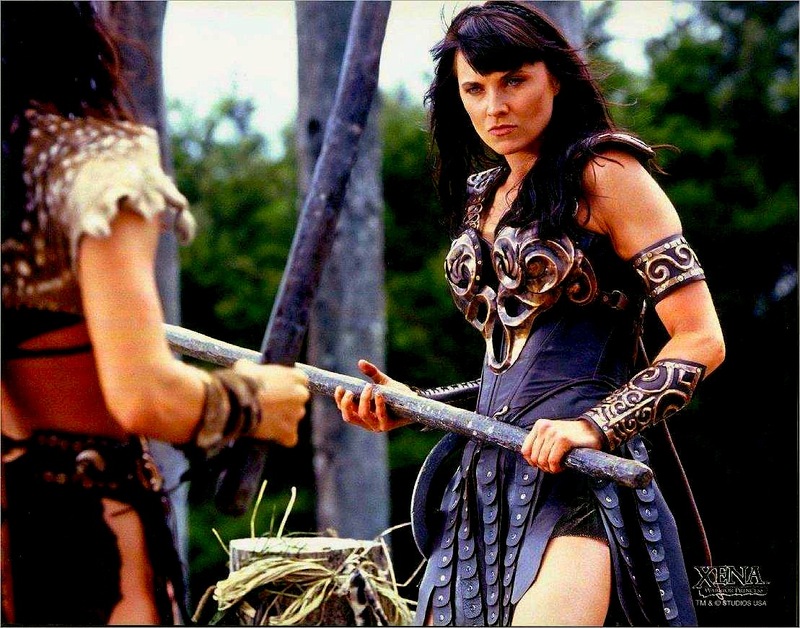 Taking place primarily in Ancient Greece, the show focused on Xena (Lucy Lawless), a reformed warlord seeking redemption for her evil past by helping others. She traveled with her best friend, Gabrielle (Renée O’Connor), an aspiring bard and the chronicler of Xena’s adventures. “You Are There” is probably the strangest episode of the series — and that’s saying something. “Married With Fishsticks” is the most bizarre, but at least the audience is afforded an explanation for the proceedings: it’s a dream concocted by the unconscious Gabrielle. This episode, in contrast, gives no reason as to why a 21st century reporter (who looks an awful lot like Iolaus) is in the midst of this story about retrieving some golden apples. (Incidentally, a friend of mine just watched the entire series straight through for the first time. She liked 130 of the 134 episodes. This was one of the four for which she didn’t care.) Ultimately, one’s enjoyment of this episodes comes down to his or her ability to accept the absurdity and appreciate it for what it is. I’ll admit that I think that the episode’s decision not to provide explanation removes some of the episode’s emotional gravitas, and even undermines the series’ legitimacy by trivializing the fourth wall. Now, with all that said, the bit is entertaining, and Hurst does well. In fact, this device allows for a unique structure that might actually be pretty efficient — information can be dished out explicitly. But laughs are obviously the motivating force, like when Nigel goes to Hell and interviews Lucifer, or during Eve’s expletive-laden rant during her prayer circle. They’re nothing more than jokes. So, I guess the success of the gimmick rides on personal tastes: does it make you laugh? If it does, then that’s all the explanation that is needed. 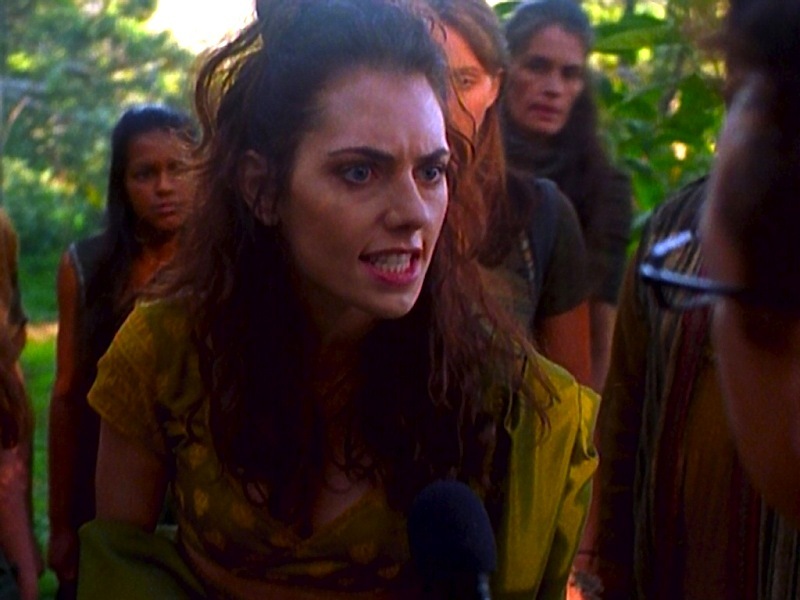 Meanwhile, though I find the Xena and Gabrielle stuff amusing, I actually didn’t think either actress was at her best here — specifically Miss O’Connor, who didn’t seem to quite understand how to play her character sans love. It all just came off forced. But, again, the major reason this episode didn’t make my top list is that the reporter gimmick, though amusing, just isn’t warranted for a story that could be powerful on its own. Again, spectacle in favor of substance. Oh well… it IS Season Six. Written by Joel Metzger | Directed by Chris Martin-Jones | Production No. I find this episode conflicting in many ways. But before I go into my likes and dislikes, I want to mention that this is the final episode of the series to feature Eve. There was talk of her returning in the finale, but it never came to fruition. That actually doesn’t disappoint me; the character ended up being (in my opinion) a fairly big BUST after her conversion, and they never quite explored an effective mother/daughter dynamic. But, I think, as it stands, this episode gives nice closure to her character, and probably, because of its story, is her best episode of the sixth season. The premise is an interesting one. Eve returns to Amazon lands to bring Eli’s message and atone for her atrocities against their people, but backed by an army of Romans, the Amazons don’t take too kindly to her visit. She’s put on trial and sentenced to death. (Excellent conflict that promises a lot of good drama.) 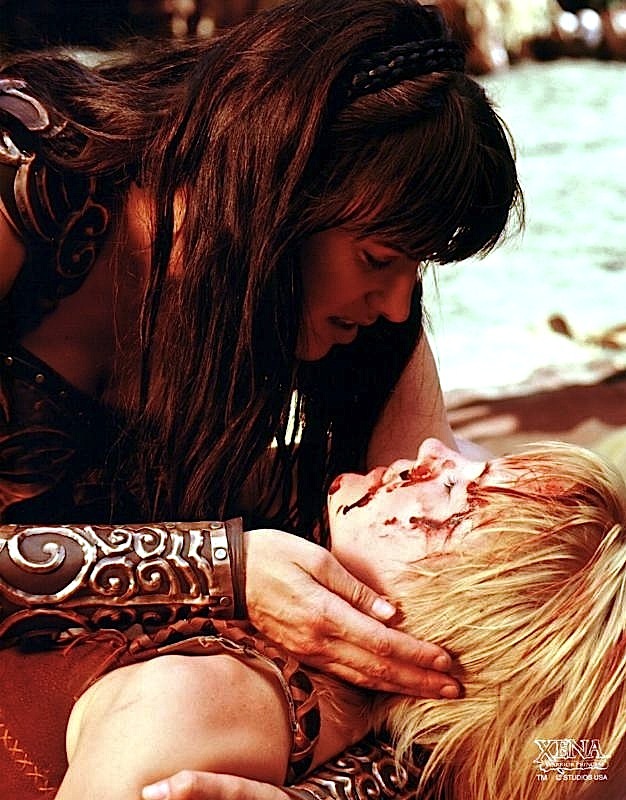 There are several solid moments here — most of them dealing with Eve trying to make amends, which works because of the thematic connection to Xena’s own quest for redemption. Meanwhile, not counting his appearance in the “lost scroll” episode — the infamously awful “Soul Possession” — this is Ares’ last episode in the timeline proper. However, it’s dramatically satisfying to have the character back to assuming his role as a villain, as opposed to the complex hero that he spent time playing during the last half of Season Five and the first half of Season Six. With everything that’s happened between Ares and Xena, their relationship is brilliantly summed up in his analogy about the scorpion and the swan. The scene is very smart, and is one of the most memorable moments from the episode. Unfortunately, little else from this episode makes sense — specifically Varia, who, already in her third of four appearances, proves herself to be a pawn by the writers to further whatever storyline they want to tell. In short speak, she’s a malleable character that lacks organic development. In fact, the lack of logic and consistency with the Varia character is a major detriment to ALL the Amazon episodes of Season Six. It just happens to be the most noticeable here. It makes NO sense that she’d start training with Ares, who, in the season premiere, was their enemy. Nope, not buying it. Also, not buying that Varia could beat Gabrielle up in the boxing ring. (Gabrielle trained with Ares too, writers.) This is a major beat that doesn’t work. However, that scene aside, the episode is tightly constructed and actually manages to be one of the last solid installments of the series. (There’s also a pretty good fight scene with Xena and Varia that, though forced because of the storytelling, is still expertly executed.) So, there IS a lot to enjoy in this episode, and though flawed, I appreciate the atonement story that was being told and felt the script handled Xena’s relationships with Ares and Eve quite nicely. Come back next Thursday as we begin a new series of posts — looking at Xena-relevant Hercules episodes! And tune in tomorrow for another 1935 Film Friday post! I actually love and enjoy You are there as absurd as it can be it is one of my favorite comedy. It is made for laughing and not for logic. Comedies are for laughing usually they do not have to be explained. Thanks for reminding me how much I love Xena! I just went back and watched an episode, so good! Pingback: THE XENA SCROLLS: An Opinionated Episode Guide (613 & 614) | THAT'S ENTERTAINMENT!